Der Artikel Wolfgang Amadeus Mozart (1756-1791): Apollo & Hyacinthus KV 38 wurde in den Warenkorb gelegt. 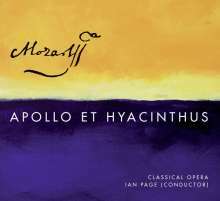 1998 und 2006 spielte das Orchester Classical Opera in Inszenierungen der Mozart-Oper „Apollo et Hyacinthus“ und wurde von Publikum und Kritikern frenetisch gefeiert. Es gehört seither zu den beliebtesten britischen Opern-Ensembles der jüngeren Generation. Jetzt präsentiert das 1997 gegründete Originalklang-Ensemble unter seinem Dirigenten Ian Page diese Oper, die Mozart im Alter von elf Jahren komponierte. 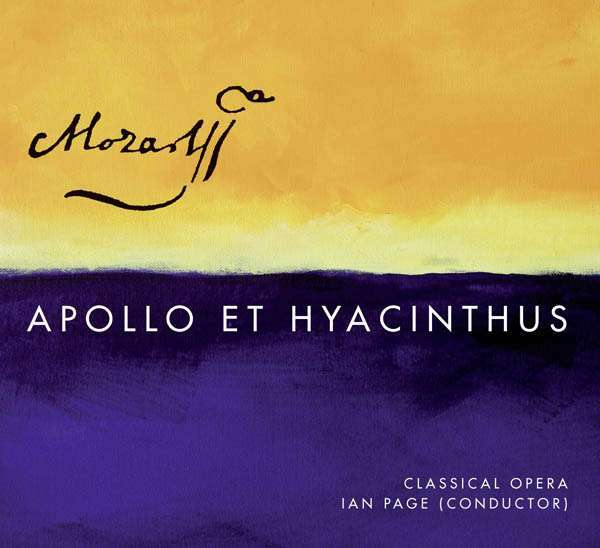 - Following its successful full length opera, ‘Artaxerxes’, Classical Opera return with the first in an epic series of Mozart operas ‘Apollo et Hyacinthus’. - Classical Opera has mounted two staged productions of Mozart's Apollo et Hyacinthus (1998 and 2006), with both receiving critical acclaim. 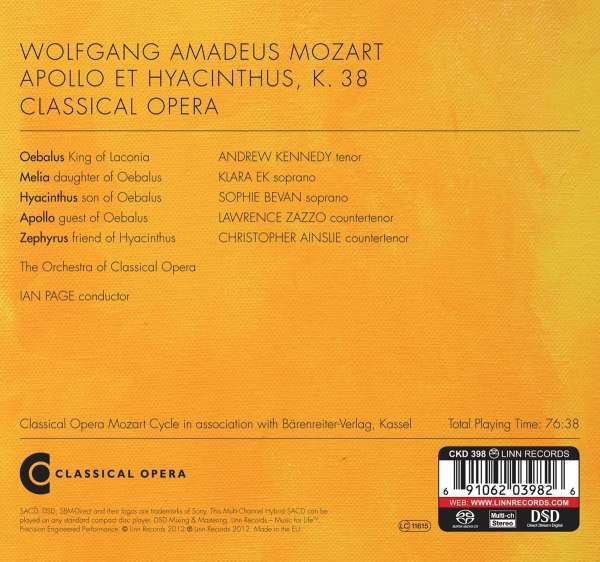 - This recording has been eagerly awaited since its 2007 debut CD, ‘The A-Z of Mozart Opera’ was released, described by David Vickers in Gramophone as ‘glorious...fresh, diverse, insightful and illuminating’. - The company features a mix of seasoned and young performers including Klara Ek (Melia), Sophie Bevan (Hyacinthus), Lawrence Zazzo (Apollo), Christopher Ainslie (Zephyrus), Andrew Kennedy (Oebalus), Marcus Farnsworth and David Shipley (Priests of Apollo). - Classical Opera was founded in 1997 by conductor Ian Page. It specialises in the music of Mozart and his contemporaries, performing with its own period-instrument orchestra, and is considered one of Britain's most exciting and highly regarded young arts organisations.